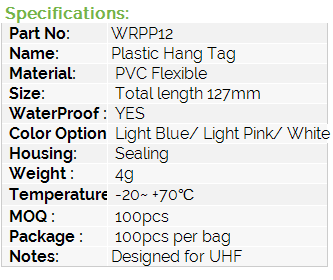 Click the button below to add the Plastic Hang Tag, Flexible PVC, UHF GEN2 (WRP12) to your wish list. This hang tag is designed for UHF to reach long range reading distance up to 5m. It can be locked with plastic clips to attach on bags, cables. The flexible plastic is water proof. GYRFID can also do service of laser logo, laser UID, Encoding service for such UHF Tags.